Posted October 7, 2013 . Filed under Featured, News & Events. The Centre for Journalism and Communication Research (CJCR) is pleased to announce the publication of Journalism: New Challenges, edited by Karen Fowler-Watt and Stuart Allan. The free e-book is available to download as a PDF on the CJCR website, where you can also download each chapter as an individual PDF. 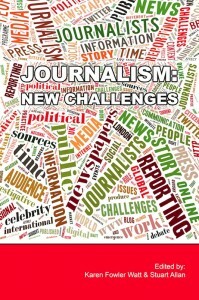 We have also made the book available via Dropbox (http://j.mp/Journalism-New_Challenges). Journalism: New Challenges contains 29 engaging chapters prepared by academics and journalists, in addition to an introduction by the co-editors Karen Fowler-Watt and Stuart Allan. and the rise of citizen journalism, live-blogging and social media, amongst many others. The chapters are written in a crisp, accessible style, with a sharp eye to the key ideas, concepts, issues and debates warranting critical attention. Each ends with a set of ‘Challenging Questions’ to explore as you develop your own perspective, as well as a list of ‘Recommended Reading’ to help push the conversation onwards. May you discover much here that stimulates your thinking and, with luck, prompts you to participate in lively debate about the future of journalism.